T-Shirt is not guaranteed if you register after noon April 22nd, 2019. 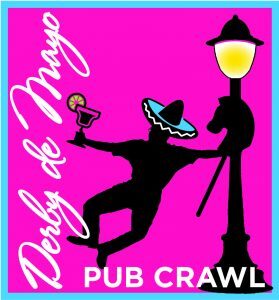 To pre-order tickets and receive a free Derby De Mayo T-Shirt for the event please fill out the form below by April 22nd. Ticket pre-order tickets are available online until May 3rd. Be sure to fill out each Crawlers FULL name for their punch tickets. All ticket holders are eligible for the prize drawings for gift cards to local pubs when their punch ticket has been punched at all pub locations. After the form is submitted you will be redirected to Paypal to make a payment. You can use your Paypal account or a credit card to complete the payment.